Once you have accepted the offer of a place in a Higher Degree Research program at UNSW, there are four main steps to starting your research degree, including formal enrolment in your program and collection of your UNSW Student ID card. The HDR Welcome and Orientation is an important event that provides you with key information to ensure a smooth transition to your research candidature at UNSW. UNSW expects all researchers to practice responsible research conduct. Research Integrity is a core component of research training for Higher Degree Researchers, and all newly enrolled candidates must complete an online course once they have finalised their enrolment. All candidates need to complete an enrolment form to formally commence their candidature. Candidates should commence their candidature by the start date of their first term. Contact the Art & Design Student Centre. Contact the Research Student Unit to make an appointment. If you have been offered a UNSW Scholarship, submit your Commencement of Study form along with your completed enrolment form, by the relevant Term Start Date. Your Commencement of Study form was sent to you with your scholarship offer letter. For more information on the commencement of your scholarship, download the Scholarship Commencement FAQs. Once enrolled, all candidates must apply for a Student ID Card. For information regarding the earliest date, time and location that you can collect your ID Card, please visit Student ID Card. Candidates based at the UNSW Canberra campus should contact the Research Student Unit. All newly enrolled candidates are required to attend a HDR Welcome and Orientation. This important event provides you with key information to ensure a smooth transition to your research candidature at UNSW, and occurs during Term 1, Term 2 and Term 3. The HDR Welcome and Orientation is an opportunity to meet key members of the UNSW Graduate Research team, including the Dean of Graduate Research, Professor Jonathan Morris, and the Directors of the Graduate Research School, Lucy Jones. A small fair is also held with members of the graduate research community at UNSW including Arc and the Researcher Development Unit. For information about the next HDR Welcome and Orientation, visit Workshops and Events. Candidates are given two key publications at the induction: the Postgraduate Research Handbook and Orientation Essentials. These publications cover policies, procedures and guidelines, provide advice and resources, and list useful contacts. Electronic copies of these publications are available below. UNSW expects all researchers to practice responsible research conduct. UNSW's research foundations are built upon standards of excellence, truthfulness, ethical actions and legally permissible conduct. 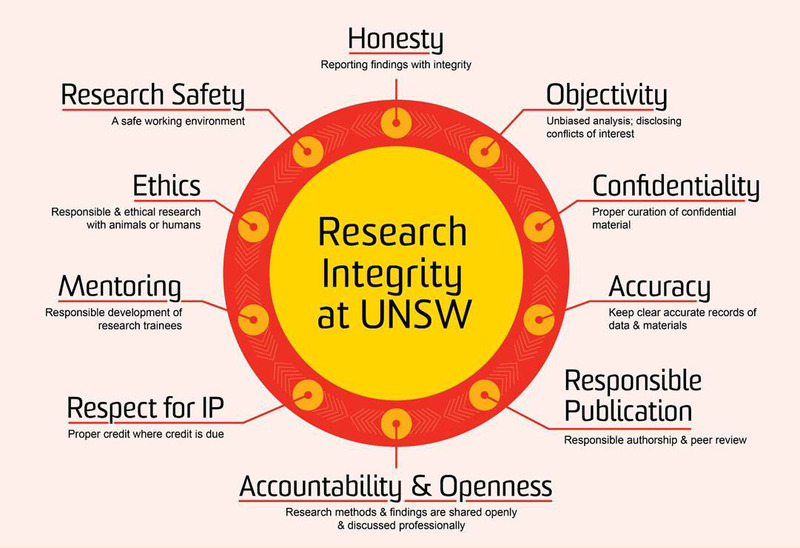 Research Integrity is UNSW’s commitment to creating and maintaining an environment that promotes responsible research conduct. This framework encompasses honesty and accuracy, objectivity, confidentiality, accountability, ethical conduct, and research safety. All newly enrolled candidates are automatically registered for a Research Integrity online course. This course includes a compulsory assessment comprising 16 multiple choice questions which you must successfully pass (85%+). After you enrol, you will receive an email from the Researcher Development Unit with a login key and some details on how to complete the course. For more information, visit UNSW Research Integrity. Research data and material allows research findings to be validated and has long term value as a potential resource for future research and teaching. Newly enrolled candidates are required to complete a Research Data Management training course. After you enrol, you will receive an email with instructions on how to complete this course, so please keep an eye on your UNSW email account.